Use heartier autumn greens and seasonal produce to make your salads substantial and satisfying. Who says salad is just for summer? It’s true that fresh summer produce is almost gone from the farmers markets (and if you still have tomato and cucumber plants in your backyard garden, they’re probably looking a little sad). Even though the nip in the air leads us toward warm, hearty soups, stews, braises and roasts, don’t take salads off the menu. A well-composed salad that blends seasonal produce with substantial add-ins can be just as satisfying in the cooler months. 1. Start with sturdier greens. Kale — curly or Tuscan (aka black or dino) — is an obvious, and ever-trendy, go-to. Not a kale fan? Maybe mustard greens or shredded cabbage are more up your alley. Raw Brussels sprouts are also fabulous in salads — simply shred them or slice off the stem end and separate the leaves. All of these greens actually grow in the cold months and feel heartier than spring’s tender greens. 2. Incorporate roasted vegetables. Whether warm or cold, roasted vegetables lend heft, texture and substance to salads. You can even go all in and use roasted vegetables as the basis of your salad. Preheat your oven to 425 to 450 degrees. Cut your veggies of choice into roughly bite-size pieces, toss with olive oil, salt and pepper. Spread them on a baking sheet or pan large enough that the pieces aren’t crowded (you want them to roast, not steam). Put the veggies in the oven and check them after about 15 minutes, moving them around with a spatula. Check on them every several minutes or so until they are browned to your liking. Optional: Sprinkle the veggies with granulated garlic before roasting for extra flavor. 3. Sweeten the deal. Make your salad taste like fall with sweeter seasonal produce. This includes not just apples, pears and citrus fruits, but winter squash. 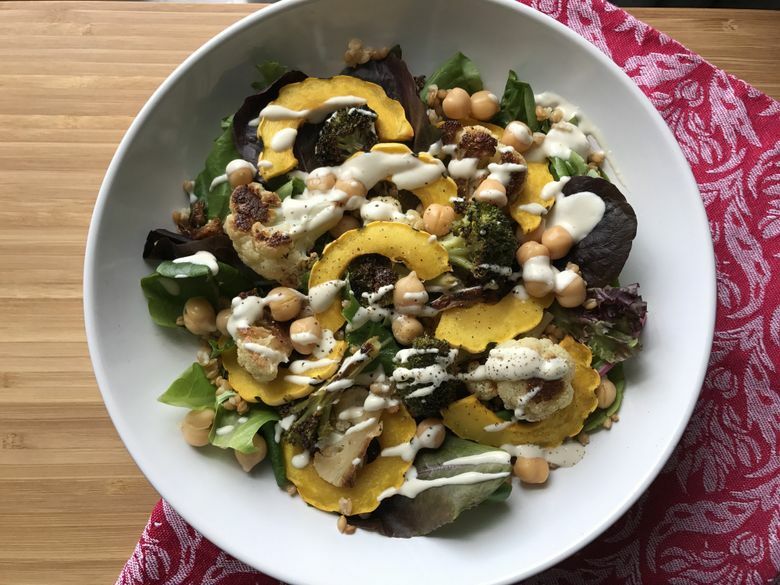 Cubed, roasted butternut squash works perfectly, but my favorite is delicata squash, halved, thinly sliced into half-moons, then roasted — you don’t even need to peel it! 4. Go richer with vinaigrettes. Vinaigrettes that use nut oils (walnut or hazelnut) and cider or sherry vinegar continue the fall flavor theme. 5. Layer texture and color. Add seeds (pumpkin and sunflower are always good), chopped nuts or chewy whole grains (emmer or einkorn farro, wheat berries, rye berries) for added nutrition and textural interest. Dried fruit — especially cranberries and cherries — and pomegranate seeds add jewel-like color along with texture and nutrition. 6. Make it a meal. To make any of these a main-dish salad, add protein. Leftover chicken or beef. Canned tuna or salmon. Cooked beans or lentils — especially French green or Beluga lentils, which pair very well with a walnut-sherry vinaigrette (see recipe). • Pear-Walnut-Blue Cheese. Start with arugula, spinach or a mix of baby greens (kale, chard, spinach, etc.) Toss with a vinaigrette of walnut oil and either apple cider, white balsamic or white wine vinegar. Top with sliced or chopped pear, crumbled blue cheese and chopped walnuts. • Apple-Pecan. Start with shredded red or green cabbage (you can use a box grater, the grater blade of a food processor or simply use a knife to slice the cabbage thinly). Toss with a vinaigrette of olive oil and either apple-cider or rice vinegar. Toss with chopped or thinly sliced apple and chopped pecans. Optional: Sprinkle on some crumbled feta or goat cheese. • Roasted Vegetable. Pair leftover roasted vegetables (broccoli or cauliflower florets and/or halved or quartered Brussels sprouts are tasty, nutrient-rich picks) with cooked emmer or einkorn farro, drizzle with lemon-garlic tahini dressing (see recipe) and top with a sprinkling of pumpkin seeds or chopped almonds. • Carrot-Cranberry-Onion. Shredded carrots with a hearty whole grain, quick-pickled red onions (see recipe), dried cranberries and sunflower seeds. Combine all ingredients in a medium bowl and whisk, then transfer to a jar. Or, for the best results, combine the ingredients in a jar, use an immersion blender to combine, then just screw the lid on the jar. The dressing will keep for almost a week in the fridge (five to six days to be safe). Whisk ingredients in a bowl or shake them up in a jar. 1. Thinly slice the onion (slices should be ¼-inch wide or less) and place the slices in a medium ceramic or Pyrex bowl. 2. Heat vinegar, water, sugar, salt and peppercorns in a small pan over high heat, stirring until sugar is dissolved. Bring to a boil, then pour over the onions. Press down with a spoon to make sure the onions are submerged in the liquid. If needed, place a small plate on top of the onions to keep them submerged. 3. Allow to sit for about 30 minutes, or until the onions are soft and the liquid is cool. Place in a sealed container in the refrigerator, where they will keep for a long time! Carrie Dennett, MPH, RDN, CD is a registered dietitian nutritionist at Menu for Change and Nutrition By Carrie. Visit her at nutritionbycarrie.com or follow her on Twitter at @CarrieDennett.